Food allergies is a topic close to my heart as many know that I have Celiac Disease-- meaning I have to live a gluten-free life or I get very sick. It makes eating out difficult at times, and it's not uncommon that one of my only viable meal options is a salad (which I'm also not really supposed to eat due to another digestive issue). My Celiac condition was identified right before my first year wedding anniversary in 2010, and while some may get angry, I cried. But not because it would forever change my life (as it has), but because I wouldn't get to eat my first anniversary cake. For a cake and cookies girl, a girl has GOT to have her cake! But never fear-- there's a happy ending here! When I called my venue and talked to the pastry chef with the news, without any hesitation, Pastry Chef Rodney said he'd be happy to recreate my oh-so-heavenly carrot cake with delectable french buttercream à la gluten-free. There was another this-time-happy crying moment, but let's move onto today's feature. I've brought on two different types of experts: The Past Bride and The Caterer. Robyn Powell was married in May 2011 at the Norfolk Botanical Gardens and, at the time, had quite the lineup when it came to food allergies and intolerances: soy, gluten, dairy, yeast, and sesame. Planning a wedding can be stressful enough, so trying to find a baker and a caterer to accommodate her dietary restrictions could have been even more of a hassle. Thankfully, she and her now-husband Greg made their first consultation with a caterer, Sweetwater Cuisine, who was a friend of their family. They both then experienced and appreciated how knowledgeable Jodi and her team really were about allergy accommodations. "When we went to talk to Jodi, I told her I had allergies, and we made a game plan for the food first. Then we discussed the allergies more to start making changes and substitutions to the food items we could. Like instead of battered side dishes, we had a mashed potato bar with custom toppings. I also found out what I just couldn't eat like her popular sweet potato biscuits." * Always make sure the caterers know what substitutions can be made for items you are allergic to. 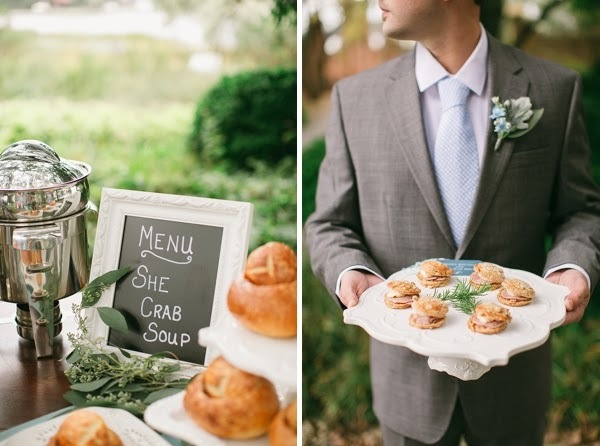 * Double check and make sure you know up front what items you can eat before getting to the reception. 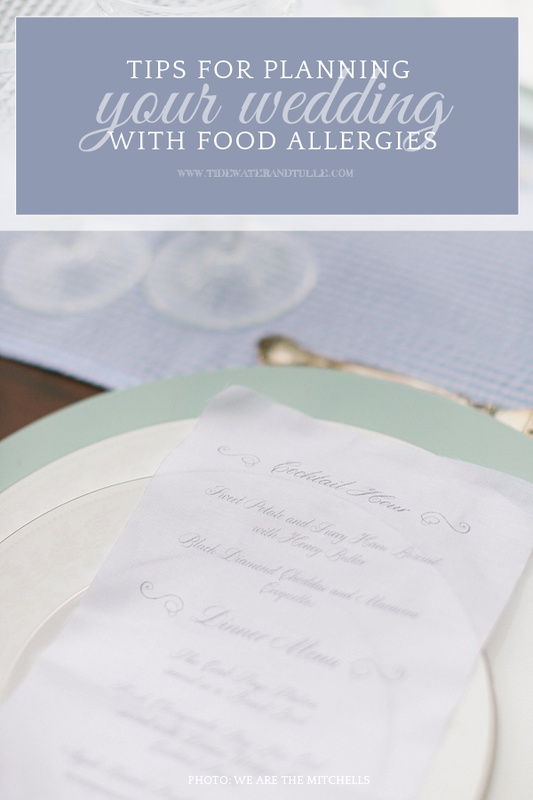 * As for guests who have allergies, try to find something they can eat or a way to have things at a base level that others can add to but is safe for them to eat. * Make sure you are comfortable with the vendors you choose. It's your special day and is nice to know you are in good hands with yummy food! 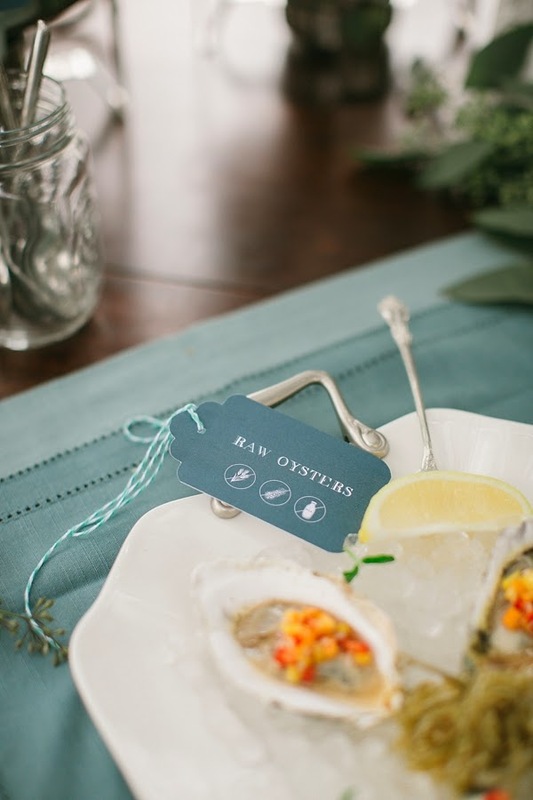 * Consider making custom food allergy tags for your food stations. This is especially helpful if you have guests with special dietary needs. Check with your caterer for all planned ingredients to help with this. On the day of, one item changed brands, and Robyn could no longer eat it, but the mark of a great caterer was that the head of staff that evening made sure to tell Robyn right away once they got to the reception. And the sweet stuff? A bride cannot forget her desserts! Sweet Temptations Dessert Cafe accommodated her requests by ensuring her "top layer" (that was conveniently elevated from the other sweets) was egg-, gluten-, and yeast-free just for her! So when Robyn and Greg cut into their cake, she could do so with excitement, knowing she could actually enjoy that special moment with no worries. 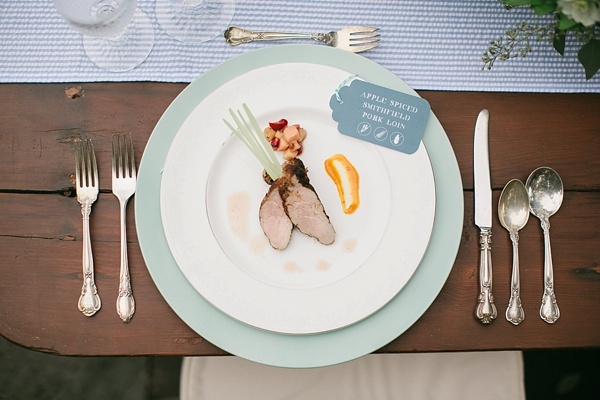 Because of their experience in the local and beyond catering industry, they have invaluable tips for when you meet with professional caterers to plan out those happy palates and tummies. * Come prepared with information. It always helps for the couple to have as much information as possible about their reception. It's helpful to know the venue, an approximate number of guests, dietary restrictions, and the style of service they prefer. It is also important to know which questions to ask - having a list of your questions/concerns for any vendor is helpful to the progress of an initial consultation. * Create a menu that reflects you and your personality. Customized menus that reflect your heritage, regions of importance for you and your to-be, and your favorite foods are always a hit! Caterers will help with this, but we do need to know where to start. * Have fun in the planning process. Work with a caterer that you want to build a relationship with to walk through this aspect of your wedding. * Have a private tasting of your menu. It's one of the best parts of being engaged and will ensure it is exactly what you are hoping for! And need some yummy inspiration to get started thinking about your dream allergen-friendly menu and proof that you aren't just subjected to salads for your big day? One of Chef by Design's favorite gluten-free and vegan friendly menu options is Roasted Butternut Squash stuffed with Brown Rice, Lentils, and Roasted Vegetables in a Tomato Coulis. Do you have any dietary restrictions or food concerns? What challenges do you face or are nervous about? Drop us a comment below! Photography by We Are The Mitchells and catering by Chef by Design. To see the full vendor credits list as well as more beautiful Tidewater and Tulle-inspired photos from our launch shoot, head over to the full feature.